A detailed Istanbul fun guide with our pick of the best Istanbul business hotels, by Charley Lanyon, and more from Smart Travel Asia and Dancing Wolf Media. Large, bustling, exhilarating, Istanbul offers something for everyone, albeit at wallet-humbling prices. We look at heritage stays, boutique inns and more in this Istanbul hotels review. Istanbul's Ataturk Airport was attacked on 28 June 2016 leaving 42 persons killed and scores injured. This was the third terror-related incident in Istanbul in 2016. Showing Turkey's resolve, the airport was open again within 24 hours. Meanwhile Russia has lifted its travel ban on Turkey offering some tourism impetus. ISTANBUL is a behemoth. Comfortably straddling Asia and Europe with a population of over 12 million, it has been a centre of tourism since Roman times. Modern Istanbul is broken down into smaller bite-size districts, each with its own special atmosphere, history and reputation. Some districts are compact, with tight, winding alleyways, quiet sidewalk cafes, hidden bookshops and gardens, while others are packed with gleaming skyscrapers, modernity, masses, and the noise and neon of any Asian capital. These dichotomies are what lend the city its particular charm. It is also why location is so important while choosing a hotel in this city. Dive in to your Istanbul holiday or business binge. Whichever way you cut it, it will be a unique experience. A myriad choices await visitors when it comes to luxury hotels in Istanbul. The number and diversity of business hotels as well is staggering. And, peppered everywhere, are wonderfully atmospheric, heritage hotels, boutique inns, and historic mansions. Almost all of the major international hotel names can be found here – no worries on your frequent guest cards – including a Grand Hyatt, two Four Seasons and two Hiltons but what makes this city really special are its unique digs. It is also one of those rare cities where the cheapest budget hotels and guesthouses are located in the most central and entertaining neighbourhoods. It's what makes searching for Istanbul accommodation both exhilarating as well as exasperating. Want to host a meeting where the markets of Asia meet Europe? Have fifty grand to drop for the honeymoon of a lifetime spent in a sultan’s seaside palace? Or are you looking for a place to crash in the shadow of the Hagia Sophia for just thirty dollars a night? You can find it all in this guide to the best Istanbul business hotels and leisure retreats. For the most part, Istanbul accommodation is spread out over three major districts. Key brand name properties covered in this Istanbul hotels review are around Taksim Square, the commercial and nightlife centre of the city. From Taksim, hotels spill north over the hills towards the Bosphorus and the exclusive Besiktas district. Besiktas is historically the seat of government and littered with palaces. These days the waterside sultan palaces have been converted into some of the most luxurious hotels in the world. The other major hotel district is Sultanahmet. 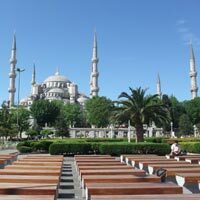 Sultanahmet is the tourist heart of the place and a starting point for an Istanbul holiday. This area contains the Hagia Sophia, The Blue Mosque and Topkapi Palace as well as a major tram terminus to make it easier on the feet. Sultanahmet is on a spit of land surrounded on three sides by the Marmara Sea, the Golden Horn and the Bosphorus. It is one of Istanbul’s oldest and most charming neighbourhoods. Many travellers who visit this city never leave Sultanahmet and hotels of every shape and description are springing up to cater to them. The shore of Sultanahmet is Istanbul’s backpacker area with rows of hostels for even the most budget conscious customer. Small, attractive boutique hotels can also be found in abundance here and the new Four Seasons Sultanahmet holds out the promise of a new era of sophistication. The Asian side of the city is much quieter than its European counterpart and lacks the wide range of accommodation available across the Bosphorus. I have included one hotel on the Asian side, Sumahan on the Water, because the experience it offers is truly special and worth the trek over the bridge. Across the square from the Marmara is the Ceylan InterContinental. For those familiar with InterContinental hotels in other cities this one will not offer any real surprises. This is not necessarily a bad thing. The hotel is attractive and well run with a good spa facility. The rooms are comfortable and the service excellent. The beds are especially worth a mention and with a nine-item pillow menu all tastes – and heads – are catered for. The high point of the hotel is undoubtedly the breathtaking view from the top floor bar and restaurant although the eatery can be a bit stuffy on warm days. Aside from Safran, the penthouse restaurant, which offers modern haute cuisine takes on traditional Turkish dishes, the InterContinental also has a more casual brasserie, an impressive patisserie and, in the summer, outdoor barbeques. Below par are the seriously underwhelming bathrooms. The Grand Hyatt Istanbul hotel looks huge from the outside but feels oddly cramped on the inside, perhaps because it is packed with restaurants, bars and boutique stores. Visitors looking for a drink or a bite to eat can choose between Spazio, a hip Italian restaurant, Agora, a predominantly Turkish restaurant overlooking the garden, a snack from the poolside grill or a sandwich to go from the Delicatessen. The Grand Hyatt also offers a wine bar, a cigar bar with a wide selection of cognacs and live jazz, and a nightclub. The rooms themselves are fine with some of the comfiest beds in Istanbul and nice deep bathtubs designed with a view of the TV. Staff is extremely accommodating and gracious. The Grand Hyatt also has a fully stocked spa and health centre. 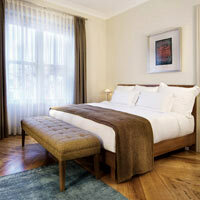 This is a dependable choice if you’re shopping for good Istanbul business hotels. Nearby is the Hilton Istanbul. If there was a competition for least attractive hotel in Istanbul, the Hilton would win hands down. The startling unimaginative exterior houses an equally off-putting, marble-drenched lobby full of rococo design flourishes and stained glass. It is design oversell. The rooms do come with private balconies but are themselves are over-decorated to the point of being uncomfortable. The health and fitness facilities are massive with indoor and outdoor pools, three tennis courts (two lit for night play), a squash court, a kilometre-long jogging track and fifteen acres of private gardens to stroll in. The staff is friendly and helpful. The lobby does have a very inviting verandah, which is a nice place to grab a drink on a hot day. Overall, however, the hotel strains too hard to make a statement though it is by all means a brisk business address. Swissôtel The Bosphorous straddles the border between the bustling Taksim area and the more laid back Besiktas area. It is a typical Swissôtel, large, clean, efficient, comfortable and extremely well designed. The staff exudes a professionalism that can border on coldness but I found them helpful and accommodating of requests. The rooms are comfortable and pleasant but certainly will not be remembered after check-out. The lobby is modern and decorated with subtle eastern touches, housing a mini shopping mall of boutique stores. This hotel is a great choice for anyone worried about tiring of Turkish food as it offers Chinese, Japanese and Swiss fare as well. The location is great with a full on-site park and sweeping views of the Bosphorus. A garden view room will set you back around one hundred and ninety Euros but it is certainly worth dishing out the two hundred and twenty Euros for the Bosphorus view. Push for an online deal. The last hotel in this area worth mentioning is also its most famous. The Ritz-Carlton, Istanbul. It is housed in a towering black-glass edifice. The exterior may not be to everyone’s liking but the interior is scrumptious. The lobby is understated and elegant. In the afternoon it fills with sunlight and positively glows and the Lobby Lounge offers superb views of the Bosphorus below. The service is what one expects from the Ritz-Carlton, attentive to the point of overwhelming and the rooms, although elaborately furnished are well executed with an impressive attention to classical detail. The marble bathrooms are especially decadent. The Ritz has two restaurants offering international dishes and a Turkish grill menu. The hotel also offers the RC Bar, based on an English club, which boasts the largest collection of single malt whiskies in Istanbul and cigars to accompany them. One of the hotel’s biggest draws is the Laveda Spa, which offers pretty much every treatment you could ever imagine. It is reputed to be the finest for wellness in the city. Mark the Ritz in your diary. This is one of the best Istanbul business hotels around. The Tomtom Suites is one of the hotels I’ve included that is not found in the three main hotel districts. It is southwest of Taksim in the Beyoglu district that serves up small boutique shops and street-side cafes. Its narrow tree-lined streets and laid back street life give it the feel of a classic European city. The hotel itself is easily missed. It is on one of the quietest streets in the neighbourhood, because it is across from the Italian embassy and the whole road is closed to non-essential traffic. You wouldn’t know it from its silent sun dappled lanes but Beyoglu is just a ten-minute walk from the bustle and bright lights of Taksim square. The hotel is new (2009) but the building is much older. The renovation has been impeccably managed. The interior is ultramodern while still being warm and homey. The whole complex feels more like a dream house than a hotel with rooms that are sleek and welcoming. They are designed to take full advantage of the ample natural light and sunlight streams in through huge windows. Rooms have every amenity including luscious beds, iPod docks and state-of-the-art stereos as well as Jacuzzi tubs in every bathroom. Most stunning is the sun-drenched rooftop restaurant and bar. The service is some of the best I have found anywhere and the staff will go to any trouble to make you feel at home. At just one hundred and eighty euros a night this hotel is almost too good to be true and is certainly one of this city’s brightest undiscovered gems. On with our guide and review of Istanbul hotels. The Conrad Istanbul marks the point of transition from the big name hotels of the Taksim Square area to the Bosphorus-side beauties of Besiktas. Although not on the water’s edge itself it is perched on a hill across from the shoreline, which affords it fantastic views of the water. The Conrad is one of Istanbul’s largest hotels with over 600 rooms. Even at this size it manages to seem tasteful and inviting. It does certainly have the vibe of a business hotel but the lobby is appealing, done nicely with dollops of marble and a large spiral staircase. The rooms themselves are average but comfortable. The bathrooms are large and offer separate bath and shower facilities. Internet is, of course, offered in the rooms although the inroom safe is too small to accommodate a laptop. Some suites offer private balconies and even if your not prepared to fork over the cash for one it is worth paying the extra money for a Bosphorus view. The hotel has good amenities including a very nice 14th floor coffee shop and bar with an attractive terrace. The fitness facilities are also impressive with an indoor and outdoor pool as well as three tennis courts, saunas, steam rooms and massage services. The W Istanbul is another popular Besiktas address. It is not on the sea. The W is located just north of the shoreline in Akaretler, one of Istanbul’s most excusive neighbourhoods, and set on one of Istanbul’s swankiest shopping streets. The hotel is ultra hip with dark, lush super-modern surrealist interiors. It is unlike your typical upscale Istanbul doss-house and a lot more like the creation of a New Yorker on acid. It’s a great effect. The rooms are tiny but they are packed with amenities and almost laughably comfortable. Your space include DVD players as well as iPod docks. W is justifiably proud of its plump beds, all accompanied by goose down pillows and duvets, and 350-thread-count sheets. The hotel offers a fitness centre as well as 24-hour room service from the kitchens of the Spice Market, the second location of the well-known New York restaurant. It is an address to mark down if hunting for hip and cool Istanbul accommodation. The Four Seasons Hotel Istanbul at the Bosphorus is one of the stars of the Besiktas area and one of the finest hotels in all of Istanbul. Parked in a restored 19th century palace it manages to preserve a regal vibe. Simply put, the hotel is beautiful. The indoor spaces sparkle and a lot of attention has gone into design and detail. The location of the hotel is unbeatable, edging right up to the lapping waters of the Bosphorus and looking out to the Asian hills. 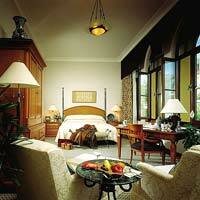 The rooms themselves are comfortable and opulent without being too over the top. The outdoor pool backs right up to the Bosphorus, as does the expansive outdoor terrace that must be one of the most pleasant places in Istanbul to grab a drink or a grilled poolside snack. The hotel also has a dock designed to accommodate private powerboats and yachts. Fine dining options include Aqua, a Mediterranean restaurant. The hotel also has excellent spa and health centre facilities. Expect a huge gym, hair salon and Turkish baths. The most impressive element of the heath centre is undoubtedly the indoor pool, set under a sparkling skylight and surrounded by gleaming marble surfaces and columns. There are twenty-five suites including four “palace suites” which offer private rooftop terraces overlooking the channel. If you have the twenty thousand euros to spend and want a stay you will never forget consider the “Atik Pasha Suite” which includes its own private Turkish bath. 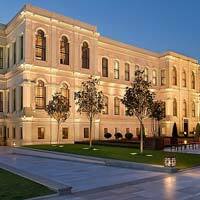 Just up the shoreline from the Four Seasons Bosphorus is the Cirigan Palace Kempinski. This award-winning property appears frequently on lists of the best hotels in the world. It actually consists of two buildings: a modern building containing 380 rooms and the famous Cirigan Palace itself, which houses 11 restored suites. The Palace served as a home for the last sultans and is one of the more impressive palaces of Istanbul. It has been painstakingly restored and the result is an opulent interior, festooned with chandeliers and covered in pink marble, which matches the building’s famously ornate façade. The palace also houses a small art gallery. The rooms in the palace wing are breathtaking. A stay in one of the Palace suites is more like a stay in a museum than a hotel but you will definitely feel like royalty. The modern building is a different story altogether. There are renovations planned but as of early 2010 the modern wing was distinctly underwhelming. Although more than thirty times larger than the palace section, it feels like an afterthought. The rooms in the modern wing are also lacklustre, if comfortable. The Kempinski offers a 24-hour pool that is the only one of its kind I found in the city. The service is impeccable. In my opinion, unless you are willing to spend money to stay in the palace wing, your dollars will be better spent at the Four Seasons next door. The Hotel Les Ottomans is located far up the shore from the Kempinski all the way up past The Bosphorus Bridge. It stands on its own a good distance away from other hotels and offers an experience unlike any other in the city. 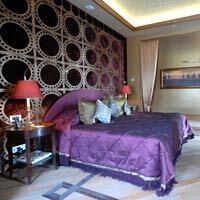 The hotel is the brainchild of Ahu Aysal-Kerimoglu, a Turkish woman who lives at the hotel in an owner’s suite. This address is in a restored Ottoman palace and contains only 10 rooms, all suites. The rooms are richly decorated but some verge on being overdone. Its Yali Hatun restaurant is considered one of the finest in the city and the onsite health spa claims to be the largest in Istanbul (it didn’t seem as large as the Four Seasons’ Spa to me but they assure me it is). There is also a dark and richly appointed bar as well as an outdoor verandah-restaurant on the shores of the Bosphorus. The hotel also has a private jetty to accommodate its fleet of boats. With just ten rooms the hotel’s small size is one of its greatest selling points. The hotel is quiet, homey and intimate with personalised service. In terms of must-see sites the Sultanahmet district undoubtedly reins supreme. This nub of land jutting into the Golden Horn is packed to the hilt with mosques, palaces and museums including Hagia Sophia, the Blue Mosque and Topkapi Palace. The biggest sites are gathered around a major tram terminus and just beneath them in the winding streets of old Sultanahmet are block after block of eateries, lodgings and obligatory carpet shops. This area has traditionally been a rich hunting ground got cheap Istanbul hotels and affordable (read: charming and attractive) backpacker hostels. The Four Seasons Hotel Istanbul at Sultanahmet is at the vanguard of a handful of hotels trying to bring a sense of luxury and sophistication to this traditionally budget and touristy area. Among the perks of the Four Seasons Sultanahmet is that as a guest you will be able to brag to your friends that you have spent the night in a Turkish prison. The hotel is housed in a converted prison that was in operation from 1919 until 1970. Prison or not the building and hotel are exquisite. The thick walls and hotel’s small size (just 65 rooms) make it an oasis of peace – not all straitjackets – in bustling Sultanahmet. The hotel contains a good restaurant with inviting outdoor seating and two bars, one in the lobby and one on the roof. The rooms are understated and homey with all the amenities including very comfortable beds and great bathtubs for an afternoon soak. 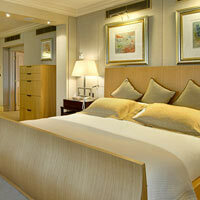 The hotel manages to balance a sense of luxury without too much extravagance. The only downside, other than the somewhat steep price tag, is the lack of pool or health facilities. The property tries to make up for this by offering guests free use of the stunning facilities at its sister hotel The Four Seasons Bosphorus. Some guest may resent the 20-minute taxi ride just to use a treadmill. The Celal Sultan Hotel (pronounced Jel-el) is another option for slightly higher end accommodation in the Sultanahment area. The place has a good feel, a nice aesthetic and is famous in the area for its delicious breakfast. Undoubtedly the greatest selling point is the large rooftop terrace, half enclosed, where meals can be served. The terrace is quite pleasant, especially on a warm day, and offers wonderful views of the surrounding monuments. Unfortunately, the rooms vary radically. The standard rooms are oddly sized, do not offer safes or bathtubs and have uninviting pillows. The suites on the other hand are opulent with comfortable beds, real claw foot tubs and private terraces with views looking over the Hagia Sophia. The deluxe rooms have bathtubs and safes but at four hundred and ninety Euros they are way overpriced. For the same price you might as well stay across the street in the Four Seasons. All rooms have free WiFi. The Hotel Empress Zoe is real find in the Sultanahmet area. It looks tiny from the outside but actually contains five separate buildings. Each room is different and all are designed in a casual but funky Ottoman style. The hotel has a series of inviting outdoor terrace spaces and is literally clustered around the 15th century ruins of a historic hammam (bath house). The staff is exceptionally warm and justifiably proud of the hotel. What sold me on the Empress Zoe was the penthouse suite. It is a cosy Ottoman-style room on the top floor with a private Turkish bath and personal terrace overlooking the garden. The room comfortably sleeps four and at just two hundred Euros a night is one of the best deals a family can find for unique Istanbul accommodation. Unfortunately the hotel does not have an elevator so it would be an inappropriate choice for the handicapped. 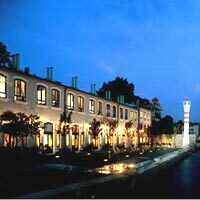 The Yesil Ev hotel and restaurant is another great but often overlooked address in the Sultanahmet district. The hotel itself is attractive and set on spacious grounds. The lobby is classic, airy and inviting and opens onto a large interior courtyard with outdoor seating surrounding a marble fountain. The courtyard also has a large greenhouse where drinks and meals are served in winter months. Yesil Ev is small, only nineteen rooms, and as a result the service is attentive and thorough. The price scale tops out at five hundred Euros for one night in the Pasha Suite: a room that would delight Marie Antoinette. All rooms offer free Wi-Fi. The Seven Hills Hotel is another quality option. The lobby is wood panelled and on the dark side. The vibe of the hotel is all business but the service is warm and casual. The rooms are not exceptional but are comfortable and offer all modern amenities. For some reason this place is especially popular with Americans. The Seven Hills Hotel does have one of the nicest terraces in the district with fine views. Even if you’re not staying here it is worth stopping in for dinner at their acclaimed rooftop seafood restaurant. We continue with our Istanbul accommodation guide and cross over to the Asian side of the Bosphorus where things are much more tranquil. It is much more residential and because it offers fewer sites or bright lights, it often misses out on the tourists. For a traveller in Asian-Istanbul this can be both a blessing and a curse. The Asian side is laid back, often beautiful and refreshingly free of snap-happy tour crowds. That said, it does lack the wide variety of accommodation available “in Europe”. There is one hotel here that stands out. The Sumahan on the Water is the brainchild of the husband and wife architect couple who designed it. Although the design is ultra-modern, it is still welcoming and homey and manages to feel appropriate in the old distillery building that houses it. The hotel is small. All of the common areas are packed with books and little inviting places to read, check your e-mail or sip some tea. The hotel is right on the water and is quiet enough to allow you to hear the Bosphorus lapping the shore outside your room. The rooms themselves are so comfortable you will never want to leave. In-room fireplaces come standard with beds set up on platforms looking out over the water. Although two of the standard rooms only have showers most come with spacious bathtubs as well and the suites come equipped with private Turkish baths. One of the most difficult things about staying on the Asian side is getting there. The traffic over the bridges can be nasty and the ferry system daunting for newcomers. The Sumahan on the Water solves this problem by offering a private launch service which ties right up to the hotel’s private dock and can whisk you in minutes to anywhere in the city. Travelling almost entirely by water shifts the way you view and appreciate Istanbul and is part of the reason staying at the Sumahan on the Water is so unique. The Crowne Plaza Hotel, Istanbul, is located in the Alcsaray district, an area famous for commerce and a heavy East European presence. The lobby is opulent, seemingly aimed at the Russian businessmen who frequent the place. The layout of the hotel is interesting with four blocks of rooms set off from the lobby. The architectural details are supposed to be reminiscent of harems but lack decoration of any kind. It is like standing in an Ottoman airplane hanger. The rooms are small and have no bathtubs. The real draw of the Crowne Plaza, which is clearly set up to compete with Istanbul business hotels, is the impressive health club facility. The Turkish bath on site was one of the nicest I’ve seen. And the futuristic indoor pool, complete with mood lighting, looks right out of Starship Enterprise. The Radisson Blu Bosphorus Hotel (formerly the Radisson SAS) is a decent choice if you’re looking for a straightforward business hotel in the heart of the action near the European terminus of the Bosphorus Bridge. There is a fine, albeit overpriced, bar and restaurant, as well as a pool and health facility. The rooms are oddly decorated with strong accents of a Scandinavian dorm. 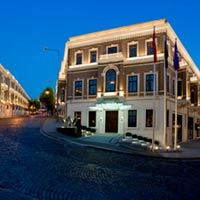 The Hotel Princess Ortakoy is another business-oriented hotel. It is close to the Radisson but in a more interesting area. The district is a warren of winding narrow streets full of restaurants and bars popular with students. The hotel offers all of the usual fare: a small outdoor pool, Wi-Fi, health and fitness facilities and inroom breakfast. Guests also get free parking. The hotel houses shops and restaurants including a Mexican-American restaurant. 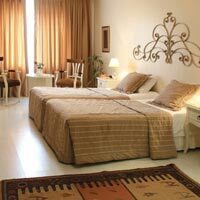 The rooms themselves are basic with very large but very firm beds and soft pillows. Expect safes but they will not accommodate most laptops. 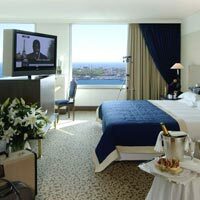 At just 120 Euros a night this is one of the better deals on Istanbul business hotels for pin-stripers on the go. And that’s the A to Z of our Istambul hotel review. The exchange rate is US$1 = 1.45 new Turkish lira denoted as YTL. Check on government charges, room service and other taxes that may be added on. Room rates quoted for Istanbul accommodation in the listing below are rule-of-thumb as guidelines only and may not reflect the actual day-to-day best rates available on the Internet or through travel agents. These rates are a mix of starting prices quoted by hotels on their "Rack Rates" or Internet prices. Celal Sultan Hotel Istanbul. Tel: [90-212] 520-9323, (www.celalsultan.com). Ceylan Intercontinental Istanbul. Tel: [90-212] 368-4444, (www.intercontinental.com/istanbul). Cirigan Palace Kempinski. Tel: [90-212] 326-4646, (www.kempinski.com). Conrad Istanbul. Tel: [90-212] 310-2525, (conradhotels1.hilton.com). 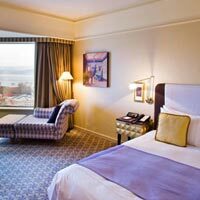 Crowne Plaza Hotel Istanbul - Old City. Tel: [90-212] 444-9333, (www.ichotelsgroup.com). Four Seasons Hotel Istanbul at the Bosphorus. Tel: [90-212] 381-4000, (www.fourseasons.com/bosphorus). Four Seasons Hotel Istanbul at Sultanahmet. Tel: [90-212] 402-3000, (www.fourseasons.com/istanbul/). Grand Hyatt Istanbul. Tel: [90-212] 368-1234, (www.istanbul.grand.hyatt.com). Hilton Istanbul. Tel: [90-212] 315-6000, (www1.hilton.com). Hotel Empress Zoe. Tel: [90-212] 518-2504, (www.emzoe.com). Hotel Les Ottomans. Tel: [90-212] 359-1500, (www.lesottomans.com). Hotel Princess Ortakoy. Tel: [90-212] 227-6010, (www.ortakoyprincess.com). Radisson Blu Bosphorus Hotel. Tel: [90-212] 310-1500, (www.radissonblu.com/hotel-istanbul). Seven Hills Hotel. Tel: [90-212] 516-9497, (www.sevenhillshotel.com). Sumahan on the Water. Tel: [90-216] 422-8000, (www.sumahan.com). Swissôtel The Bosphorus, Istanbul. Tel: [90-212] 326-1100, (www.swissotel.com). The Mamara Taksim. Tel: [90-212] 251-4696, (www.themamarahotels.com). The Ritz-Carlton, Istanbul. 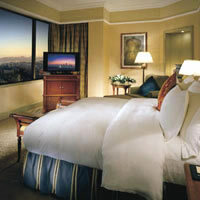 Tel: [90-212] 334-4444, www.ritzcarlton.com). Tomtom Suites. Tel: [90-212] 292-4949, (www.tomtomsuites.com). W Istanbul. Tel: [90-212] 381-2121, (www.wistanbul.com.tr). Yesil Ev Hotel. Tel: [90-212] 517-6785, (www.istanbulyesilev.com).